‘Books carry on conversations across the thresholds of time and space’, writes Josie Alwyn in her introduction. This book is the fruit of her ‘conversation’ with Brien Masters – a collaboration that began more than twenty years ago, when she was learning to be a Waldorf teacher. They open their discussions with the broader theme of the role and ‘mission’ of drama in human development, before focusing on the central topic: the potential for metamorphosis inherent in Shakespeare’s plays. This creative, birth-giving, transformative essence of Shakespeare – the esoteric core of his work – is vitally important to our times, they suggest, and contributes to the ongoing cultural education of the human soul. 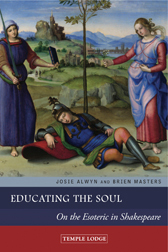 Published to commemorate the 400th anniversary of Shakespeare’s death, Educating the Soul offers an overview of Shakespeare’s journey as a playwright in the context of evolving human consciousness. The heart of the book features nine essays on Shakespeare’s most performed plays. Just as the middle act of a Shakespearian drama gives a point of transformation, so these essays represent the central, unfolding dialogue that took place between the writers as the book developed. This section is followed by an in-depth study of Hamlet, that sees the story as a learning process, deeply strengthened by the primary character’s own education and changing consciousness. Finally, the book explores the theme of transformation through The Tempest and in relation to the archetypal ‘tree of life’. Accessible to all, the motifs of the various chapters in this book are woven lightly together, enabling the reader to follow the contents in sequence, or to dip in and pick up the threads at any point. JOSIE ALWYN, born in London in 1951, has lived most of her life amid the South Downs in Sussex. She was educated at Lewes Grammar School and Sussex University, graduating with an MA in English Renaissance Literature and Drama. Doctoral research led her deeper into the classical and medieval streams of thinking that flow into Shakespeare’s writing, and also introduced her to the work of Rudolf Steiner. The beginning of family life in 1984 opened vocational pathways into Steiner education: first in the Brighton Steiner School and at the London Waldorf Teacher Training Seminar with Brien Masters, then at Michael Hall Steiner School in Forest Row as Upper School English teacher. Josie is currently co-director of the London Waldorf Seminar and a Steiner Waldorf Schools Fellowship adviser. BRIEN MASTERS (1931-2013) was a distinguished educationalist, musician and a prolific author. Qualified both as a State and Steiner-Waldorf teacher, he taught for more than 50 years, and acted as a consultant up to government ministerial level. He wrote numerous articles and publications for use in schools, and his Doctoral thesis was a critical appraisal of Waldorf praxis in the light of Rudolf Steiner’s educational ideas. His career included appointments as Choirmaster and Organist in the Anglican Church, Chair of the Steiner Waldorf Schools Fellowship, Editor of Child and Man and Steiner Education, and Director of the London Waldorf Teacher Training Seminar. His books include Kindling the Word, Mozart and Adventures in Steiner Education.